After the Eagles 27-20 defeat to the hands of the Green Bay Packers, head coach Andy Reid had plenty to talk about. One of the most pressing concern coming out the week one loss was the injury status of his starting quarterback, fullback, center and middle linebacker. Unfortunately for the Eagles, Jamaal Jackson and Leonard Weaver look to be lost for the season as Reid said Weaver tore his ACL and Jackson tore his biceps. Look for Mike McGlynn to be the team’s starting center and for the Eagles to sign a fullback since there are none on the roster besides Weaver. On the positive side, middle linebacker Stewart Bradley and quarterback Kevin Kolb who suffered concussions were “fine” according to Reid. However Eagles fans would disagree with Kolb being fine after his porous performance against the Packers. His 50 percent completion rate was barely better than his 56.2 QB rating. Still, Reid declared that if Kolb were healthy to go against Detroit next week then he would be the man under center. Still, Michael Vick looked like the better quarterback. He also appeared to have learned the nuances of the position. He can beat you not only with his legs, but his arm as well. 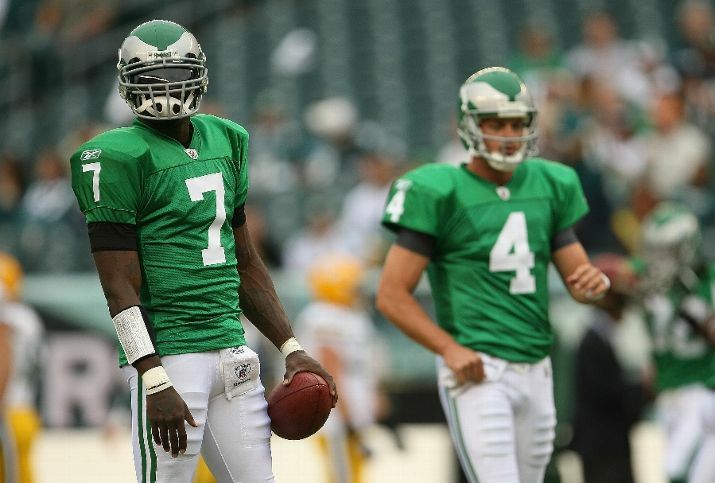 While Reid has faith in Kolb, the city of Philadelphia might have been in awe of Vick’s skills and behind him. "(FB) Leonard Weaver has what looks like a torn ACL. He will have a MRI in the morning. (C) Jamaal Jackson has a torn bicep, and he will also have a MRI in the morning. (MLB) Stewart Bradley and (QB) Kevin Kolb both received concussions." "It was kind of like two different games, and we have to make sure that we play the second one throughout four quarters. I thought our defense started off very strong, and our offense started off very slow. We weren't able to get the things done that we needed, between Green Bay's pressure and whatever else might be involved there. I have to make sure that I get that taken care of and give guys a better opportunity to achieve. I was proud of the way the guys finished. It came right down to that last drive, and one more yard and we're still moving that thing, putting it in (the end zone), and playing some overtime." "They were fine. All of the questions that they answered with the doctors registered well, but as it went on, they weren't feeling well, so we took them out." "I am going to meet with the doctors and we'll see how it all works out here – how they test out." "I know our doctors and (Head Athletic Trainer) Rick Burkholder were on top of it. They thought he tested out okay on the sideline." "Our doctors and our trainer were on it. The bottom line is we ended up taking him out." "I'm going to take the responsibility for this. There were a few different things going on there. It wasn't just the quarterback or the offensive line. It was a combination of things. I'll make sure I go back and fix that." "Kevin will be fine. I think we all had a piece of this loss, and like I mentioned before, I need to make sure that I put all of them in the right position. We missed a couple of throws and we had too much pressure. Actually some of the calls were not the right calls for what we were seeing defensively. That's my responsibility to make sure we're doing a better job there." "I think Michael did a phenomenal job today. He brought the team back, he kept his poise, and he had some big runs, and he made some big throws. I'm happy as heck for Michael. I'm not looking to the future, I'm trying to get the offense fixed so that we can win some football games here." "We tried to make a few adjustments and do a couple of different things. Green Bay came out and played us in a nickel front most of the game, actually all of the game. We made a few adjustments there, and we were able to move the ball." "It didn't look like there was quite as much pressure. Michael took off and ran a couple of times and had big plays there, but then we had the fumble, so we had a slow down there. It's a matter of everybody doing their job – me included. I thought we made some decent adjustments at halftime from what they were doing. It's my responsibility to make sure we make those sooner rather than later." "If we make the play like we've done before, then we're not out of this game. That's something that we worked on, and we thought we could get the first down, whether it was the shotgun formation or not." "You have to learn from it, forget about it and move on. That's what you do. We still had a lot of game left, and we felt like we were going to get the ball back, which we did. He did what he thought was right, and for a slip second, we almost scored there and we're right back on it, and we score the next time." "Normally if it's torn, you're probably out for the year." "It looked like Mike actually did a very good job, but I'll have to look at the tape on it because it's too hard to see. But right now, it would be Mike McGlynn." "I was going to run in and play. I don't know that. Hopefully it doesn't come down to that. We were short in a couple of spots like the fullback position, but you have to make do. With the numbers the way they are, obviously you can't get everyone activated that you need to. That's how it works." "I will meet with (General Manager) Howie Roseman, and we'll talk that through." "He's a phenomenal guy. He's a phenomenal player, and a phenomenal guy. That was a very ugly looking injury the way I saw it from the sideline. I could tell right away, and I started walking out on the field almost before the play was over, the way it got hyper-extended." "We thought it was the right thing to do. I can't sit here and tell you now that it wasn't right, because that was the plan we had and we felt strong about it. It didn't work." "That's just what we do there. In hindsight, it still was a good idea. It was the right strategy, but we just didn't get it done at the end." "He was there to return kicks and to play special teams. I wasn't sure exactly when or how we would use him during the game. I just needed to get a feel for how Ellis Hobbs and DeSean Jackson held up in the return game, and both of them were able to make all of the opportunities that they had." "At the beginning of this game offensively and penalty-wise, things weren't clicking. Whether (Green Bay) had us covered or doubled or pressured, there were a variety of things that were happening there and it just wasn't meshing. The guys needed to battle through it and work it out, and when they did that, good things happened."